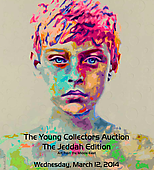 Ayyam Gallery Jeddah is pleased to announce that it will hold the second edition of The Young Collectors Auction in the Kingdom of Saudi Arabia at its space in Jeddah on 12 March 2014. The Young Collectors Auction is the ideal setting to venture into the world of art collecting with the majority of estimates well under $12,000 and many lots offered in the entry-level range of $3,000 to $5,000. The second edition of the Young Collectors Auction will feature 40 lots of painting, sculpture, photography and limited edition prints from acclaimed and emerging artists throughout the region. Emerging talents will be showcased alongside renowned established artists from the Middle East. Reflecting Ayyam Gallery’s wider commitment to strengthening creative infrastructure in Saudi Arabia, it is especially important to note that the auction will include lots by various important and emerging Saudi artists, providing a platform for artists from the Kingdom to gain exposure to new audiences and continued success. A catalogue detailing the artwork to be auctioned will be available in PDF format online or a hard copy can be collected from any one of Ayyam Gallery’s numerous locations. Without pretension and aimed at making the auction experience and the appreciation of art accessible and enjoyable to all, The Young Collectors Auction welcomes the public to a viewing prior to the auction where specialists are available to answer any questions visitors may have. With the flexibility to bid in person or register for telephone and absentee bids online. The Young Collectors Auction allows even those abroad the opportunity to participate in the auction. The first of its kind in the region, The Young Collectors Auction was launched in Dubai in 2009 as part of Ayyam Gallery’s innovative approach to catering to its diverse range of clients and to introduce new regional talents to the art scene. These public sales have highlighted some of the Middle East’s most exciting figures, featuring prominent and budding artists from across the Arab world, Turkey and Iran. The Young Collectors Auction works with other Middle Eastern galleries and collectors to ensure a vast selection of painting, sculpture and photography that is at once authoritative and robust. Expanding the number and quality of lots with each edition, The Young Collectors Auction has become an essential part of the region’s acclaimed lineup of yearly art events. Location: Bougainvillea Center Jeddah, Third Floor, King Abdulaziz Road, next to Stars Avenue, Al-Zahra District, Jeddah. For press information and artwork images, please contact press@ayyamgallery.com or call +966 12 613 4111 / +966 12 613 2011.